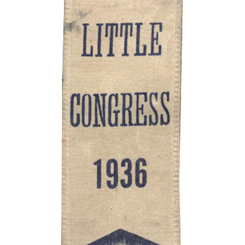 About this object One of the more prominent congressional staff organizations of the 20th century, the Little Congress club counted among its membership future Representative and President Lyndon Johnson of Texas. On this date, the Little Congress—a group mainly composed of secretaries and clerks for Representatives and Senators—met for the first time. Created to provide a forum for public-speaking experience and increased knowledge of parliamentary procedures for congressional staff, the Little Congress modeled itself after the House of Representatives. The organization adopted many of the same rules as the House, debated legislation, and elected its own officers: speaker, clerk, and sergeant at arms. As one of the four founders of the organization, Ned Baldwin—a secretary for Congressman Nicholas Sinnott of Oregon—served as the first speaker of the Little Congress. Baldwin also was credited for the name of the group. “We had a hot debate over the name, though, and considered ‘Congress Junior’ and a number of other names,” Baldwin said. “But Little Congress won.” Speaker Frederick Gillett of Massachusetts granted use of the Cannon Caucus Room to the fledgling organization—a tradition which the Little Congress continued. Co-founder Kenneth Romney, a future House Sergeant at Arms, remarked that, “A number of us employed around Congress felt we needed to know each other better, assembled as we were here in Washington from all over the country . . . our first meeting in the caucus room had perhaps eight members in attendance.” The most well-known member of the Little Congress—future Representative and President Lyndon Johnson—served as speaker of the organization in 1933. The 24-year-old congressional secretary of Congressman Richard Kleberg of Texas adeptly bypassed precedent which dictated the election of officers based on seniority by inviting a large contingent of employees (elevator operators and mailmen, for instance) to join the Little Congress. Johnson’s tactic to expand the membership beyond congressional secretaries—according to the organization’s bylaws eligibility included anyone on the legislative payroll—paved the way for his surprise election as speaker. As presiding officer, Johnson transformed the Little Congress into a finely-tuned organization with membership in the hundreds. Weekly meetings featured debates on upcoming House and Senate legislation, allowing Johnson to display his precise knowledge of House rules and parliamentary procedures. Johnson also invited high-profile lecturers such as Senator Huey Long of Louisiana to the club’s meetings, which led to increased press attention and notoriety. The Little Congress also boasted a lively social calendar that included an annual trip to New York City, as well as regular dinner dances and banquets. The club eventually disbanded during World War II and was replaced by the Congressional Secretaries Club—a rival organization established in 1935, partly as an explicit rejection of Johnson’s dominance of the Little Congress.